In the darkness of the Akeley Hall of Mammals, swarms of kids gawk at beautifully staged dioramas of Africa’s wildlife. The stuffed safari, nestled in the American Museum of Natural History (AMNH) in New York, includes taxidermied leopards stalking a bush pig, preserved ostriches strutting in front of warthogs, and long-dead baboons cautiously considering a viper. In one corner, in a display marked “Upper Nile Region,” a lone hippo grazes next to a herd of lechwe, roan antelope, and a comically stern shoebill stork. It takes a while to spot it and I have to crane my head to do so, but yes, there it is—a large crocodile, in the back, mouth agape, next to the hippo. It’s mostly hidden from view, and until recently, it was hidden from science, too. Five years ago, scientists would have classified it as a Nile crocodile (Crocodylus niloticus)—one of the largest of the family, and among the most feared. But in 2011, after extracting DNA from this specimen and dozens of others, Hekkala proved that the iconic species is actually two species. One had been disguised as its more widespread cousin all this time. Hekkala called it Crocodylus suchus—the sacred crocodile. It’s the species in the diorama. It’s easy to view such collections as soulless stashes, examples of humanity’s hoarding instinct unleashed upon the natural world, turning vibrant menageries into dead zoos, and living, breathing, mating, hunting, fighting creatures into mere specimens, dissembled and dissected, posed in dioramas, pinned in drawers, crammed into cabinets, and stuffed into jars. But to Hekkala and many other scientists, these hoards are full of riches still. They are time capsules that contain records of past ecosystems that are rapidly changing or disappearing. They are archives that provide clues about raging epidemics, environmental pollution, and hidden extinctions. And they are full of unknown species—like the sacred crocodile. Hekkala stumbled across it while sequencing DNA from Nile crocodile samples collected all over Africa, in a bid to understand differences between the various populations of this majestic reptile. “Because I’m a museum geek, I thought: Oh, I can get tons of Nile croc specimens from museum collections,” she says. 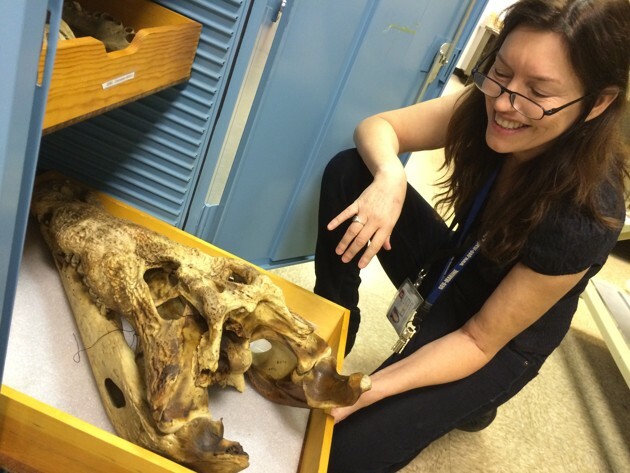 She found 16 in the AMNH alone, collected almost a century ago, and dozens more from other institutions. From each specimen, she picked off fragments of dessicated tissue, still clinging to bones or skin and still rich in viable DNA. She even managed to sequence DNA from seven mummified crocodiles from the National Museum of Natural History in Paris. “The collections manager there let us take a little piece from their tails,” she says. The mummies are around two millennia old and DNA typically degrades in hot humid conditions, but Hekkala still found enough intact helices, thanks to the Egyptians’ skill at preservation. Together, the hard-won samples corroborated Hekkala’s suspicions: The Nile crocodile was indeed two separate species. The Eastern one has two fewer chromosomes than the Western sacred crocodile, and is actually more closely related to crocodiles in the Caribbean. The sacred crocodile is also reportedly more docile than its belligerent Nile cousin, and digs caves in which it shelters. The Egyptians seemed to know the difference: The mummies that Hekkala studied were all sacred crocs. At that time, both species used to co-exist along the full length of the Nile. Today, they mostly stick to different parts of Africa. They only share space in museums. The specimens reveal more than the mere identities of their owners. Their sizes and shapes show how bodies adapt: how lizards evolve longer legs when faced with invasive fire ants, or how songbirds become smaller as the climate gets hotter and sharper-winged as deforestation forces them into open habitats. Their DNA reveals how some endangered species have experienced plummeting levels of diversity, while others have started to regain their lost genetic wealth. Their cells contain traces of parasites that reveal the origins of epidemics, like the apocalyptic fungus that is killing the world’s amphibians, or the avian pox virus that is sweeping through Galapagos birds, or the male-killing bacteria that briefly feminized a species of Pacific butterfly. Every technological advance opens up fresh value in these old treasures. Using next-generation sequencing techniques, scientists can extract DNA from the unlikeliest of sources, even animals that have been submerged in embalming formalin. They can yank out isotopes of carbon and nitrogen that reveal what an animal was eating. They can identify environmental polllutants—in one study, an American team documented a blue whale’s lifetime of pesticide and mercury exposures by studying a plug of preserved earwax. There is an unorthodox bat-cave in the Smithsonian Museum of Natural History, in Washington D.C.—a cavernous room where thousands of bats, rather than hanging vertically from rocky crevices, mooch horizontally in steel cabinets. 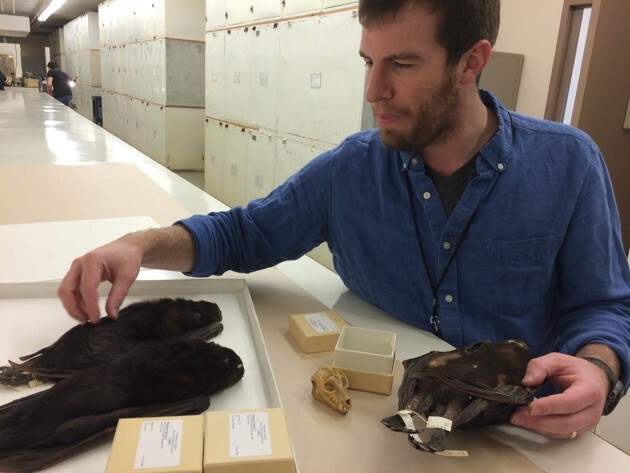 From one such cabinet, Kris Helgen, the museum’s head curator for mammals, pulls out a drawer containing three stuffed and disarmingly large bats. With night-black fur and rounded heads, they look a bit like Toothless from the How to Train Your Dragon movies. Their bodies, just shorter than my forearm and their wings, being too big to mount outstretched, have been pinned in a folded position. This is the greater monkey-faced bat, one of the largest bat species in the world. The creature lives only in the Solomon Islands, where it uses its enormous and rather un-bat-like teeth to crack into coconuts and other hard fruit. Scientists had seen and collected it, but they had always mistaken it for another big, black bat that shares the same island. Helgen only realized the difference during a museum-hopping trip to study the world’s monkey-faced bats—a trek that took him to the Australian Museum in Sydney, one of the few institutions that houses both animals. Side by side, the differences were obvious. The other species has a banana-yellow belly and flowing back fur, while Helgen’s bat is black and short-furred. Also, every tooth in their mouths is different.“You can have two of the biggest bats in the world living together, very easy to tell apart, and just because they’re both big and black, no one knew the difference,” says Helgen. The average specimen languishes for 21 years before it’s formally described; one poor neglected pit viper waited for 206 years. These mix-ups are common because biologists in the field often lack the time or expertise to go over everything they grab. They collect first and ask questions later. Vast hoards of specimens end up in natural history museums, overwhelming the dwindling population of taxonomists who could potentially classify them. According to one study, the average specimen languishes for 21 years before it’s formally described; one poor neglected pit viper waited for 206 years. This means that many “new” species are already sitting in jars and shelves, gathering dust while they await “discovery.” Charles Darwin, Alfred Russel Wallace, Alexander von Humboldt and other legendary naturalists of yesteryear catalogued life’s grand diversity by hopping across continents and islands, but their modern counterparts can make similar discoveries by criss-crossing the world’s museums—for there be dragons. “It’s almost quaint that that’s how it’s still done,” says Helgen. Helgen is something of a mammal-discovering machine. He has revealed around 30 so far, and has about 20 more waiting to be published—an impressive feat given how familiar this group is. His strategy is simple but effective: find what he calls a “blind spot”—a group of mammals that no one has thoroughly studied—and look at every specimen he can find, in every natural history museum he can get to. That’s how he identified the greater monkey-faced bat. And it’s how he identified his most famous find. In 2003, Helgen went on another museum-hopping trip to study the olingos, an obscure and little-studied group of tree-dwelling raccoon relatives. He saw plenty of examples, but in a drawer at Chicago’s Field Museum, he found a surprise. “Here were these fluffy orange-red skins that had nothing to do with anything I’d seen,” he recalls. “I thought: These can’t even be olingos.” After studying the skins and the accompanying skulls, Helgen realised that they belonged to an unrecognized species, which he called the olinguito. Once Helgen knew what to look for, he found several more, sitting overlooked in museum collections across the world. He sequenced the creature’s genes to make sure that it was as distinct as he supposed. He even found living olinguitos in the cloud forests of Ecuador and Colombia. The olinguito looks like someone designed the world’s cutest stuffed toy and then animated it. Its adorable countenance turned it into a celebrity, especially in its homeland. After announcing its existence, Helgen was flooded with emails from park rangers and birdwatchers, documenting its presence. “It’s in enough places, and enough protected areas, that we’re not worried about in the immediate future,” he says. The greater monkey-faced bat is not so lucky. It is hunted, and it lives in old-growth forests that have largely been cleared. We’ve known about its existence for just a decade, and it’s already critically endangered. Others are even worse off. In 2009, Helgen named two new species of fruit bats from Samoa, both of which were already extinct. They exist only as specimens, collected in the 19th century. These discoveries strike me as being deeply sad, in a way that digging up prehistoric fossils is not. Here are creatures that are disappearing, or have disappeared within our lifetime, by our hand. They represent a large slice of nature that will only be discoverable through museums, because their living counterparts are no longer living. We can only learn that they existed at all by summoning their ghosts from cabinets. When Helgen and Hekkala work their way through collections, they’re like astronomers looking at the light of long-extinct stars. In the Pacific Ocean, half-way between Papua New Guinea and Hawaii, lie the Gilbert Islands, part of the Republic of Kiribati. People first settled on the islands 3,000 years ago, and with no metal around, they made blades out of the best available cutting edges—shark teeth. They would drill tiny holes in the teeth and lash them in rows to pieces of wood using coconut fibers or human hair. The result is a fractal blade—a sword blade lined with smaller spikes, which are themselves serrated. Some craftsmen even established a brand by adding teeth from particular species in distinctive places. These artisans were also running an inadvertent census. Shark teeth are species-specific, so researchers can use the shapes of the teeth in the Gilbertese blades to reveal the sharks that swam round the islands centuries ago. Joshua Drew from Columbia University found an impressive stash of these weapons in Chicago’s Field Museum, including daggers, swords, tridents, and a 14-foot lance that he describes as roughly “2.5 interns tall.” From these armaments, Drew identified eight species of shark, two of which—the dusky and spottail—have vanished. Neither of them have been seen within thousands of kilometers of the islands. They “disappeared from the reefs before we even knew that they existed,” says Drew. They’re part of what he calls a “shadow biodiversity”—ethereal, intangible, and visible only through the light cast upon museum specimens. Studies of this kind are feasible because museum collections are rarely indiscriminately assembled. They grow purposefully, through concerted expeditions that return huge troves of material from the same place, all tagged with locations, timestamps, and often intricate field notes. He was right. In 2002, Craig Moritz and others started to resurvey the area that Grinnell covered. Thanks to his notes, they could visit many of the same sites; in some cases, they stuck their traps beneath the same boulders. Their efforts, which are still ongoing, provide one of the clearest portraits of a shifting landscape over the last century. Many rodents in the Yosemite area, for example, now live thousands of feet higher than they used to, likely because of warming temperatures. Many of these resurveys are underway. Helgen is planning to retrace the steps of former president Teddy Roosevelt, whose 1909 expedition to East Africa filled the Smithsonian with over 11,000 specimens. Substituting camera traps for actual ones, he hopes to document a century of changing wildlife. “Some of those areas are national parks, and others have become agricultural regions,” he says. “We can see how that has affected local wildlife?” While Roosevelt was doing his thing, Herbert Lang and James Chapin were conducting a similar survey of West Africa. Their extensive collection ended up at the AMNH—“200,000 specimens ranging from tapeworms to rhinos,” says Hekkala, including some of the crocodiles that she studied and many of the dioramas in the Akeley Hall. She longs to retrace their epic trek, but political unrest in the area may put paid to that plan. That’s why the act of collecting still matters. A recent opinion piece, published in the top-tier journal Science, argued that specimen collecting risked killing off vulnerable species, and should be supplanted by audio recordings, camera-trap images, and non-lethal tissue gathering. It drew a loud response from more than 100 biologists, who argued that none of those strategies beats having an actual specimen.